Two years ago I found myself alone. Recently divorced, and my buddy Amber, a 15 year old lab mix had to be put down. She could no longer walk, see or hear, and this was not the quality of life she once enjoyed. I took five months to grieve and then decided I could no longer take the quietness of the house. I have always loved German Shepherds, we had them growing up. My dad worked two jobs so my mom could stay home with us kids and he always said if you want your family protected, get a shepherd. 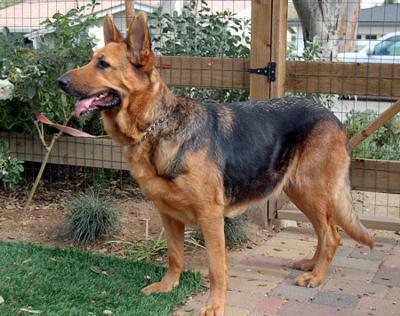 Having no clue what I was doing, I checked on line and found Westside German Shepherd Rescue in Los Angeles. I immediately saw a boy and fell in love. Unfortunately, the description said “no cats” and I have one. My cat gets along well with dogs, but does not want to be eaten! I contacted the rescue on line and told them my situation. Away from home about 10 hours a day. The dog had to tolerate cats, and had to be an older dog. I wanted a dog past the peeing, pooping in the house, digging, and jumping stage, one that just wanted to be fed, loved and walked. They contacted me a few days later and told me about Lady. She was nine years old and had cataracts. She was the epitome of her name. I looked at her profile and filled out the application, eagerly awaiting their reply. Since I live 50 miles away they had no way of coming to check out my house or yard, so I took pictures of every angle of the back yard! Two weeks went by and nothing. I sent them an email and said thank you, I must not have been accepted. They replied with “we’re just extremely busy, please come down Saturday and take her home! I went down and got Lady that Saturday. As I was leaving, the lady said “wait we have someone we want you to meet.” They brought another dog out, a five year old boy, Baldwin. They asked me if I wanted him, I said no, I only wanted one dog. As we walked around the block I heard his story. Living with a foster mom in a house with three other male GSD’s there were squabbles and he would not fight back. At one point he must been in a home where he was chained up, he has no bottom canines, probably from chewing on something metal. They handed me some medication, and explained he had hip problems. I put them both in the car and drove home. I have a car where the back seat folds down. They patiently laid in the back for the hour long drive home. Lady was the calmer of the two dogs and she just wanted to go in the house. When I got home I put Lady in the backyard and took Baldwin for a walk. After a mile I noticed some dogs ahead. They ran up to Baldwin and he just looked at them like “what do you want me to do“? I noticed he was walking behind me and getting slower and slower. I then looked at the bottle of medication they had given me - it was Rimadyl. He had hip dysplasia. I took him home and looked up everything I could on it. This past May, after having the dogs a year, Lady had a stroke. I didn’t know dogs could have strokes. The vet said the choice was mine, but she was in pain, so I had no choice. After a few months I contacted Coastal German Shepherd rescue in Orange County. This time I told them I needed someone to get along with Baldwin. We picked Rose, a five year old female. She was used to have puppies over and over until she developed mammary tumors. Whoever owned her filed her teeth down so she couldn’t fight back when the male mounted her. She outlived her usefulness to them so they dumped her. The rescue took her in, paid to have the tumors removed and put her up for adoption. She will also have to be on Rimadyl for the rest of her life. There is something special about adopting an older dog. 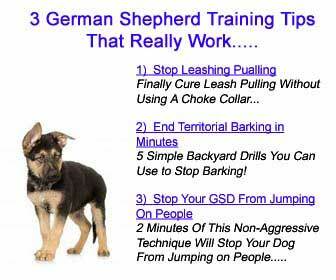 They are usually trained. No messes in the house. Nothing is chewed up. They don’t try to escape. They don’t jump. And they learn incredibly fast. Not all adopted dogs are this way, but I work with mine, everyday. They just want love and a good home. I have had Rose for four months now. I take them on walks several times a day. They spend most of the day playing with each other. Not the slightest bit of aggression. Good luck if you’re a possum on the fence in the backyard! They enjoy waiting for the mailman so he can pet them. Cesar Milan says you don’t get the dog you want, you get the dog you need. How I ended up with Goofy and Pluto, I have no idea. I know that when I walk down the street with two 100 pound German Shepherds, people cross the street thinking they will be eaten. Little do they know they would be licked to death. how wonderful they have a home. There are so many animals that are in the shelters that would bring blessings into peoples lives.